And after talking with Leslie Billig yesterday about puzzle magazines and puzzles by mail, I wanted to do a quick post talking about the many ways modern solvers have access to puzzles. For some people, puzzling starts with the newspaper. Once you’ve caught up with local and world events, had a few chuckles over the comic strips, and perused the classifieds for the tag sales you want to check out this coming week, the crossword is part of their daily ritual. And then there’s the bread-and-butter of our pals over at Penny/Dell Puzzles, the puzzle magazine. On the newsstand and in racks at bookstores and shops all over, puzzle magazines (and independent puzzle books) are some of the most recognizable brands in publishing, and it’s rare that I ride the train without seeing at least a few of these being enjoyed on a daily basis. 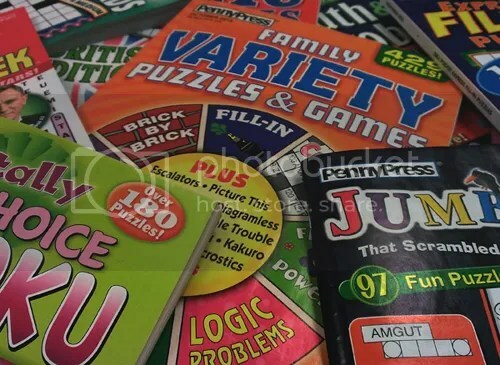 Of course, you can get puzzle magazines by mail as well, signing up for subscriptions for your favorite titles, as well as buying bundles to keep you puzzling through a long winter or an agreeable summer. This brings me to the next avenue for puzzlers: Puzzle of the Month programs. 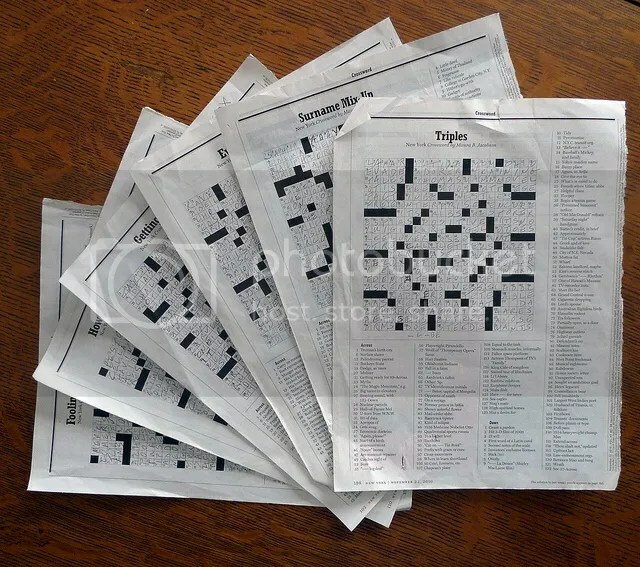 Subscriptions like The Uptown Puzzle Club and The Crosswords Club deliver puzzles right to your home every month, in case you’ve already plowed through your puzzle magazines and the daily crosswords in the paper. Naturally, these days, anything you get by mail, you can get by email, so there are also puzzle of the day/week/month programs online. The American Values Club Crossword offers individual puzzles as well as weekly puzzles, and many constructors (like friend of the blog Robin Stears) have subscription programs as well to keep you busy. And, of course, there’s an ever-expanding field of puzzle games and apps for the modern solver. Your phone, e-reader, or tablet are now optimal puzzle-delivery systems, locked and loaded with puzzles anytime you’ve got a free moment or some downtime, whether it’s waiting at the doctor’s office, being stuck in traffic, or playing a round of Words with Friends around the dinner table. It’s never been a better time to be a puzzle fan, with so many ways to enjoy your favorite brain teasers and mental challenges. This entry was posted in Games, PuzzleNation, Puzzles and tagged About Us, american values club, american values club crossword, crosswords, Crosswords Club, games, Geeking Out, Los Angeles Times, Los Angeles Times crossword, New York Times, New York Times Crossword, Penny Press, Penny/Dell Puzzles, Pop culture, PuzzleNation, Puzzlin' fool, Robin Stears, Uptown Puzzle Club, Will Shortz by gmdirect. Bookmark the permalink.